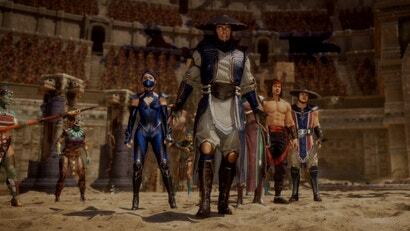 Pascal is one of NVIDIA's greatest achievements in the past decade. 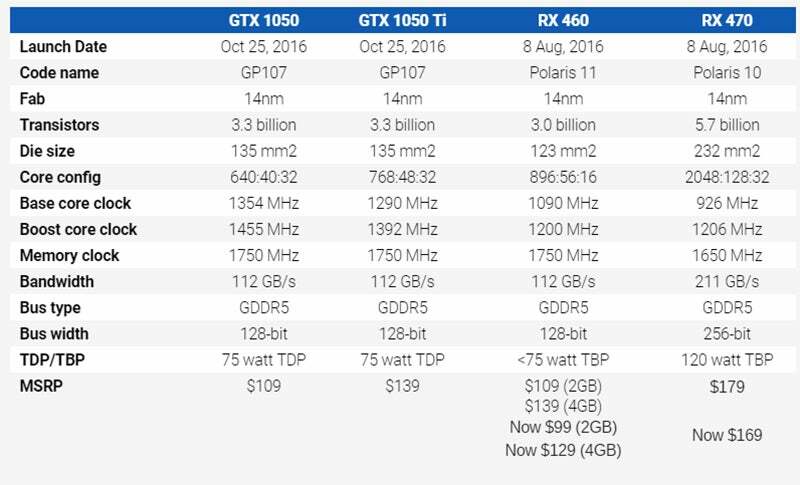 The company's latest GPU architecture took gaming performance to the next level with the GTX 1080 in May and then again with the Titan X only a few months later, though you'll need $US600+ ($790)+ to get your Pascal party started with one of these flagships. AU Editor's Note: 2GB models of the GTX 1050 are available from $209, while the 4GB GTX 1050 Ti cards are selling from $249 in Australia. 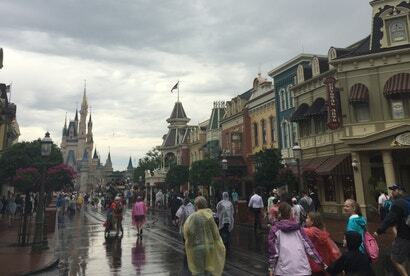 Here's a list of retailers to help you shop around. 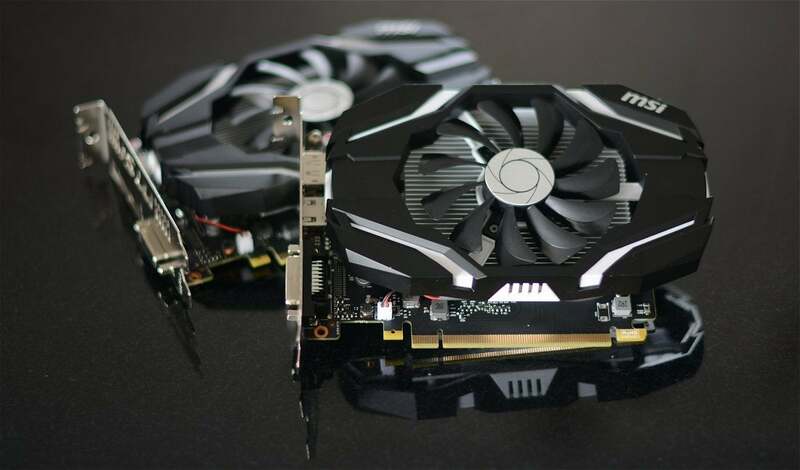 Gamers prepared to spend between $US200 ($263) and $US250 ($329) on a graphics card essentially have the GTX 1060 or its rival RX 480 to choose between (and both are fine options), while those with less cash have even fewer options, until now that is. AMD's RX 460 2GB presented itself as the best choice for around $US110 ($145) and not long ago you wouldn't have expected to find a Pascal card at this price point. With NVIDIA's announcement of the GeForce GTX 1050 and GTX 1050 Ti last week, you can tell things are about to be shaken up when AMD anticipates its rival's launch with immediate pricing adjustments. The Radeon RX 460 has promptly dropped from $US110 ($145) to $US100 ($132) while the 4GB model saw a more generous price cut taking it down to just $US120 ($158). The RX 470 was also reduced to an awfully attractive $US170 ($224). The fact that AMD was so quick to make these cuts tells us two things: they know what's coming and they know it's good. It isn't often that we see NVIDIA being so aggressive in the entry-level segment and historically they have seemed happy to let AMD take the hit on margins here. Instead of asking a slight price premium for the GTX 1050 series, much like what they did with the 1060 series, NVIDIA has decided to price match AMD. The base model GTX 1050 will be coming in at just $US110 ($145), while the beefed up 1050 Ti commands a $US140 ($184) price tag. These launch day prices should have budget-conscious gamers excited. The previous-generation GeForce 900 series offered the 950 at an initial MSRP of $US160 ($211), while the 750 Ti began life at $US150 ($198). Given the specifications and expected performance, we never imagined the 1050 Ti would sell for anything less than $US150 ($198), at least initially anyway. 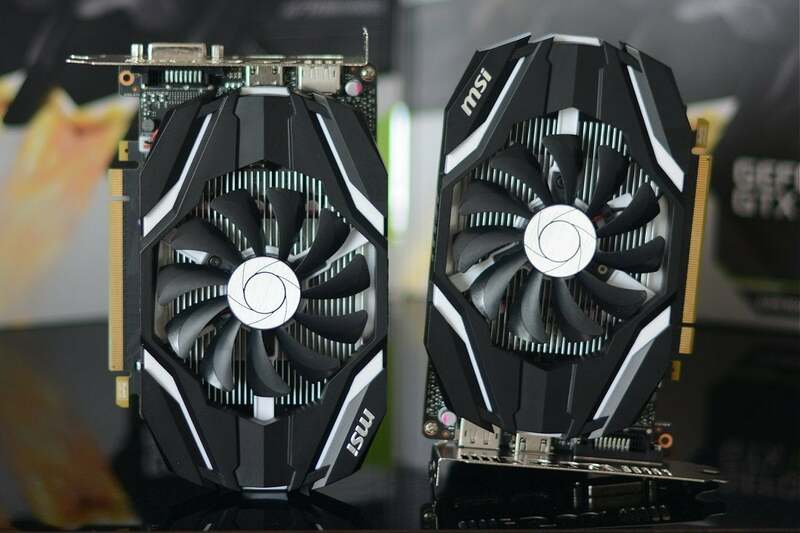 On hand for testing we have a pair of MSI cards known as the GTX 1050 2G OC and GTX 1050 Ti 4G OC. Both are essentially the same product with the exception of the GPU and memory configuration (granted, that's a rather big exception). Anyway let's check them out. The cooler features a single 80mm fan which pushes air over a plain looking aluminium heatsink. Forget about heatpipes or copper bases, this little all-aluminium heatsink measures just 95mm long, 90mm tall, 18mm thick and tips the scales at just 118 grams. The cooler is comically small for a gaming graphics card but with a TDP rating of just 75 watts we suspect it's all you need. 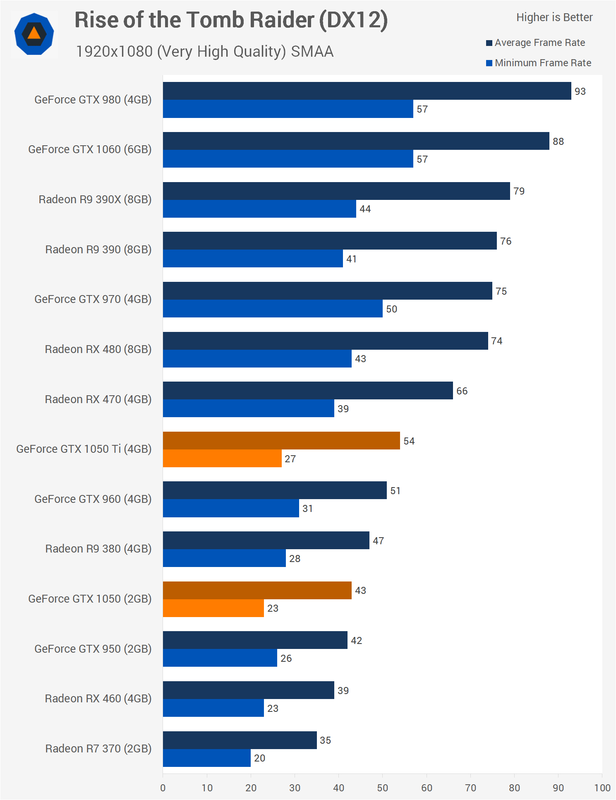 Looking at the DirectX 12 performance in Total War Warhammer we see that the GTX 1050 is 3% faster than the RX 460, though this was just a 1fps advantage so much the same performance here. The GTX 1050 Ti was 15% faster than the standard 1050 and consequently 18% faster than the RX 460. Impressively, the GTX 1050 Ti also matched the performance of the GTX 960. 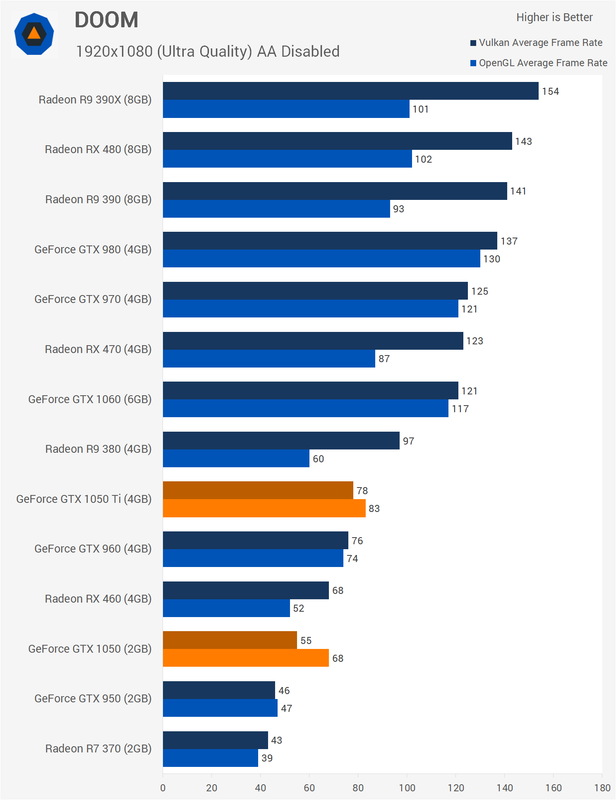 Focusing on DOOM's Vulkan performance, we find that the GTX 1050 is 19% slower than the RX 460 though it did deliver the same 68fps using OpenGL as the RX 460 did using Vulkan. So technically both cards are capable of delivering the same performance in this title. Meanwhile, the 1050 Ti was 42% faster than the 1050 when using Vulkan but just 22% faster using OpenGL. This was because of the GTX 1050's 2GB VRAM buffer. Vulkan is very heavy on VRAM usage in this title and kills 2GB cards. The GTX 1050 and RX 460 shared the same 23fps minimum frame rate in our Rise of the Tomb Raider test and when comparing the average frame rate the 1050 Ti was 10% faster, not to mention that it was 38% faster than the RX 460, but still 18% slower than the RX 470. 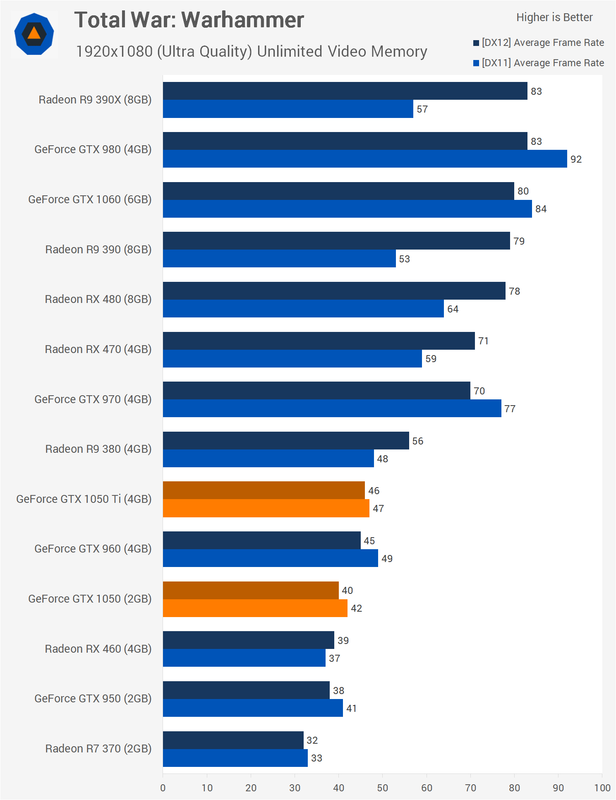 Testing The Witcher 3 with HairWorks disabled handed the performance advantage to the GTX 1050 as it was 9% faster than the RX 460 4GB while the GTX 1050 Ti was 16% faster than the 1050 and 26% faster than the RX 460. 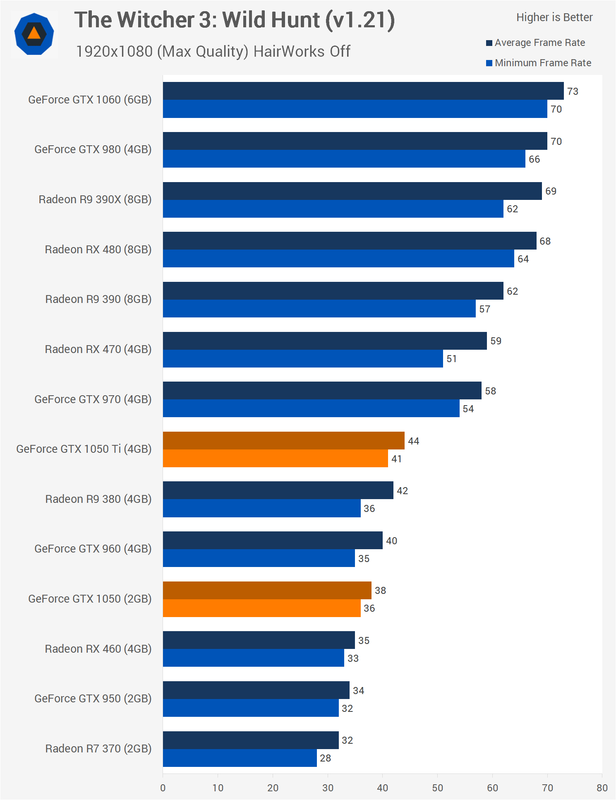 The 1050 Ti was also able to best the GTX 960 and R9 380 in this test. 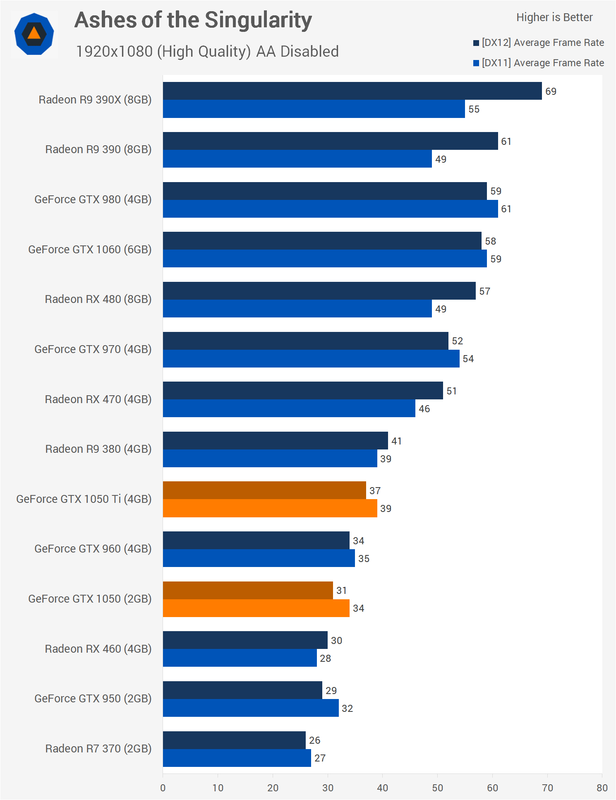 The GTX 1050 averaged 47fps in Star Wars: Battlefront, topping the RX 460 by 12%, and the GTX 1050 Ti was another 11% faster, beating the GTX 960 while being only 9% slower than the R9 380. 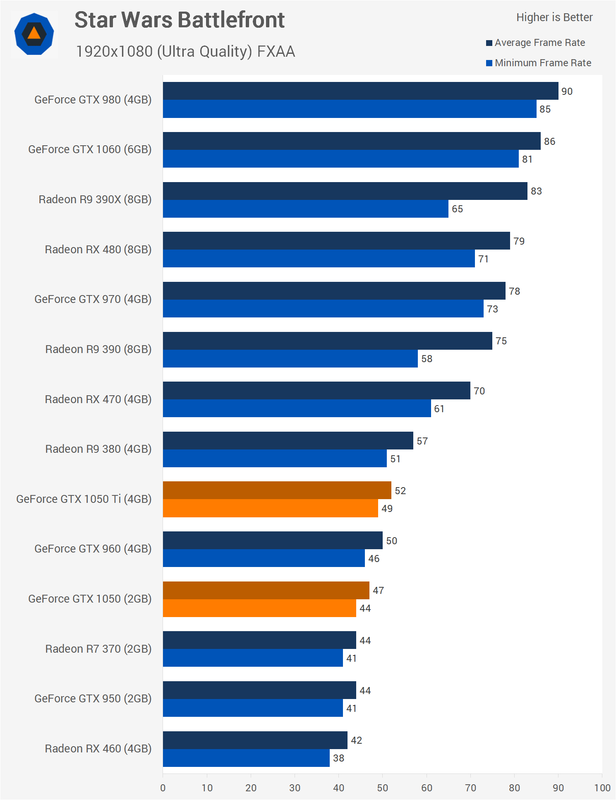 The GTX 1050 Ti was 15% faster than the GTX 1050 in Ashes of the Singularity when comparing the DX11 performance and 19% faster when using DX12. Even when using DX12 the GTX 1050 was still faster than the RX 460, albeit by a single frame. 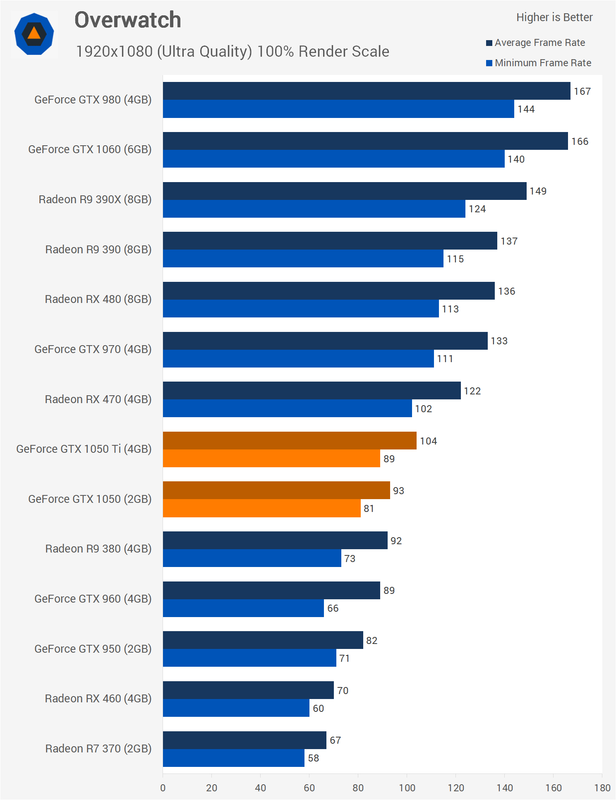 The GTX 1050 Ti averaged 37fps in The Division, just 8% slower than the R9 380 and just 9% faster than the GTX 1050. Still, both were faster than the RX 460 here with the GTX 1050 providing an extra 4fps on average or 13% faster. The GTX 1050 blitzed the RX 460 in Overwatch, providing 33% more performance at 1080p using the ultra quality settings. Meanwhile, the GTX 1050 Ti was another 12% faster than the vanilla 1050 averaging an impressive 104fps. 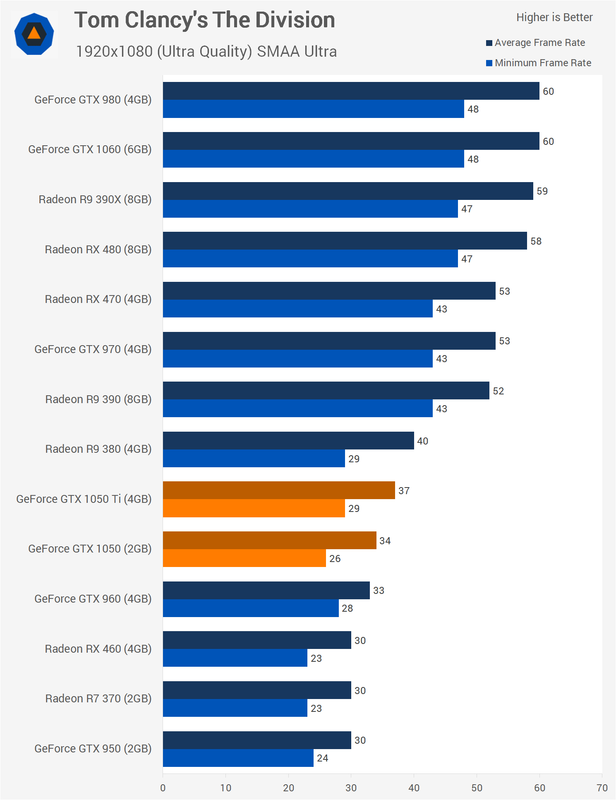 Unless you are okay with a second hand GTX 970 it would be far better value going with an RX 470 4GB ($280 New), they perform basically the same, the RX 470 has .5 GB RAM more and the GTX 970 is at the point where nvidia will not be improving its performance with drivers whereas the rx 470 will be getting that. plus DX12 and vulkan, the rx 470 will perform better in a large amount of games that use those. Seems like for $60-80 more the 1060 is better value. The 1050 is a great cheap card but I think to 1060 fits into the same budget price range and is a lot better. That being said, I'm yet to see the 1060 anywhere near this fabled $286AU locally. 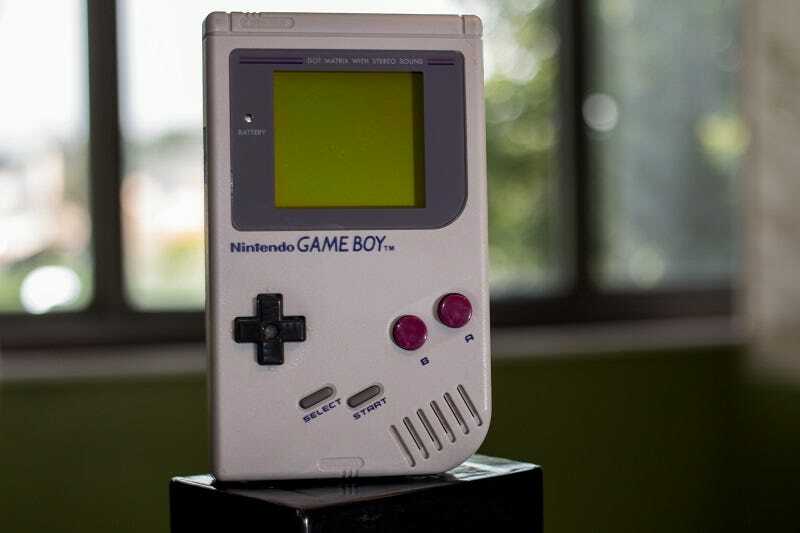 The 6GB models are closer to $400. Just looked on PCcasegear who usually have pretty decent prices, this is a terrible price, $249 for the cheapest GTX 1050Ti, when you can get an RX 470 for $289, you would have to be insane to buy the GTX 1050Ti. EDIT: i just remembered that some of the GTX 1050Ti wont need any 6pin pcie connector, so if you are dropping it some old OEM computer that has no PCIe connectors then it makes sense as it is the best card you can put in. And to me going by that price it seems like the GTX 1050 will be around $199-209 which is $40-50 more than the RX 460. the only thing that the GTX 1050 beats the rx 460 in by more than a couple frames is overwatch.